Military Medals And Awards Display Cases Proudly Display Your Air Force, Army, Coast Guard, Marine Corps, Navy, Firefighter, EMT, Police, or other hero's medals and awards in high quality hardwood display cases. Military Medals And Awards Display Cases Proudly Display Your Air Force, Army, Coast Guard, Marine Corps, Navy, Firefighter, EMT, Police, or other hero's medals and awards in high quality hardwood display cases. Flag and Certificate Case and Shadow Box-Flag and Certificate Display Case. 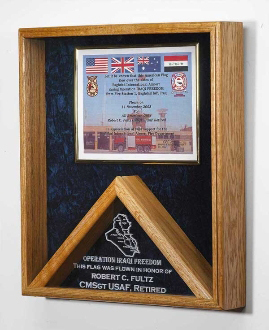 Our Flag and Certificate Case and Shadow Box is : 18" x 20" Certificate Combination Case (Solid Oak shown, select wood below). The Flag and Certificate Case and flag frame Holds 3ft x 5ft Folded Flag. you an add to the Flag and Certificate Case and flag frame (optional) Optional- Laser Engraved Map or Service Emblem On the glass Optional- up to 7 Lines of Personalized text Crushed Velvet Background, US Air Force, US Army, US Coast Guard, US Marine Corps, US Navy Deluxe Combo Awards / Flag Shadow Box 18"W x 20"H x 3"D With Raised Mounting Surfaces.